Email has been the most convenient way of conversation. It is a great source of exchange of formal and informal messages. Now, one of the most efficient methods of online marketing too. The technology is highly advanced and you don't have to type everything. With the help of touchscreen pads, stylus pens and other such devices you can directly use the pen to write on mail, like writing on a notebook, same applies to the case of drawing. The mail app that was introduced with Microsoft Windows 8, is available with Windows 10 also with certain updates. You can now draw pictures or designs of your choice in the mail. Does it excite you? Do you want to learn how to use Drawing Feature In Windows 10 Mail App? If yes, continue browsing the blog. We will give you step by step instructions on using this ultimate feature of Windows 10. 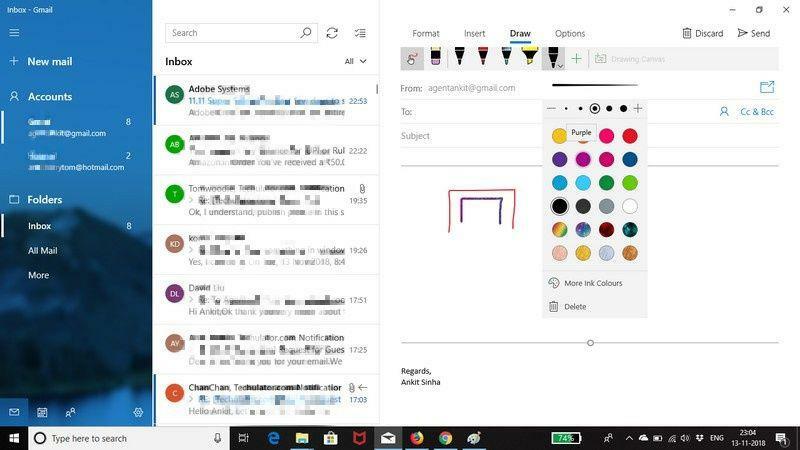 Follow the steps detailed below in the written order and you can easily learn on using draw feature in Windows 10 mail app. Even if you are unknown to Mail App and have never used it before, this mail will guide you completely. Step 1: Open the Mail app on your Windows 10. The icon for it is usually placed by default in your Taskbar. Step 2: Once the Mail app is open, click on '+' sign to add new mail. Once the window appears to compose the new mail, click on Draw button adjacent to Insert button on the toolbar. Step 3: Now click on 'Drawing Canvas'. It will open the drawing canvas in the email body for you and all your pen buttons will be activated. You can scribble to draw or write anything on the canvas. It will make multiple pens available to you which are good to go with any task. You are made available with a black and red pen. The turquoise blue pen with a thick point and also a yellow highlighter. Step 4: You can even customize your requirement by creating your own tool. You have to click on plus icon where you can choose the type of tool you want to create. A pen or highlighter. The point and thickness, you can set as per your personalized drawing needs. Click on 'More Ink Colours' to get the colour of your choice for both the highlighter and pen. To select the source that you want to use for drawing, click on the first option in the toolbar. It will allow you to select a touchscreen or mouse option. You can add as many drawings to a mail as you want. Just keep on adding canvas and keep on drawing. All the users having access to mail app can view the images. The images before sending to recipients are saved in PNG format and anyone with your file can see and download it. This is an amazing app for Windows Ink Users. It is compatible with all sorts of inputs that include pen, touch and pointing device. An amazing app that allows you to make use of surface apps. The draw is the great feature added in the mail app that allows to a faster and easier communication. You do not need to write or type very long write-ups and can express with help of self-created images. You can even share graphical notes, diagrams and any picture through this app. It is a highly useful tool and the most important part is user-friendly. By following the above steps you can learn to use the draw feature in the mail app within few minutes.